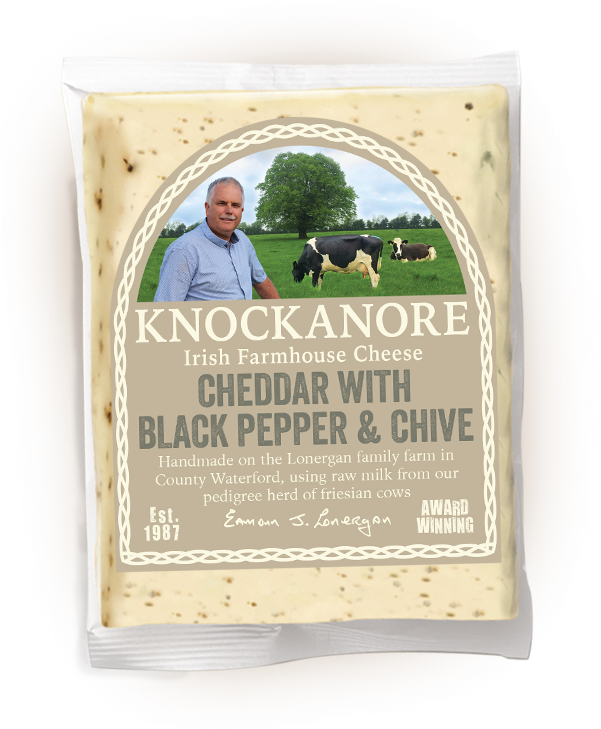 Knockanore Cheddar with Black Pepper & Chive is made using raw milk on our farm in Ballyneety, Co. Waterford. All of the milk used comes from our pedigree herd of Friesian cows that graze on the lush rolling hills of the countryside. 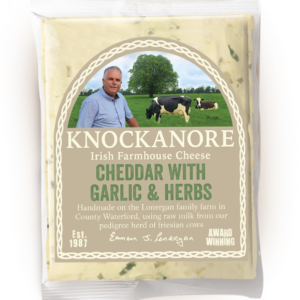 We add the black pepper and chive into the cheese vat before the cheese is actually made – this imparts a better flavour to the cheese. By way of contrast, many of our more commercial counterparts take a pre-made bulk bought cheddar and then mash in flavourings and re-mould the cheeses in to rounds! Our cheeses with herbs are aged for a little less time than our vintage and smoked cheeses and as such they have a lovely subtle sweet taste that works in harmony with the other flavours. Also, while still technically a hard cheese, it is less firm in texture. 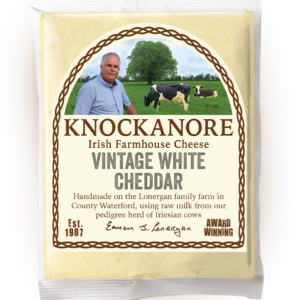 The cheese itself is mild with subtle, sweet and creamy tones with notes of black pepper and chives. Cheddar cheese (milk), annatto, garlic, chives.